Happy December!!! The countdown is on until Christmas. I love Christmas and the great feelings of happiness and joy that are brought on with the season. This year we are making an extra effort to keep Christ in Christmas and remember the true meaning of Christmas. To help countdown the days until Christmas and keep Christ in Christmas we are following an advent calendar of Service. We know that service is one thing that Christ was the best at and we are following in his example this season to celebrate him. We are using this calendar found here. Also make sure to watch the video that goes along with it here. I made our advent calendar this year and filled it with the calendar cards from that calendar. 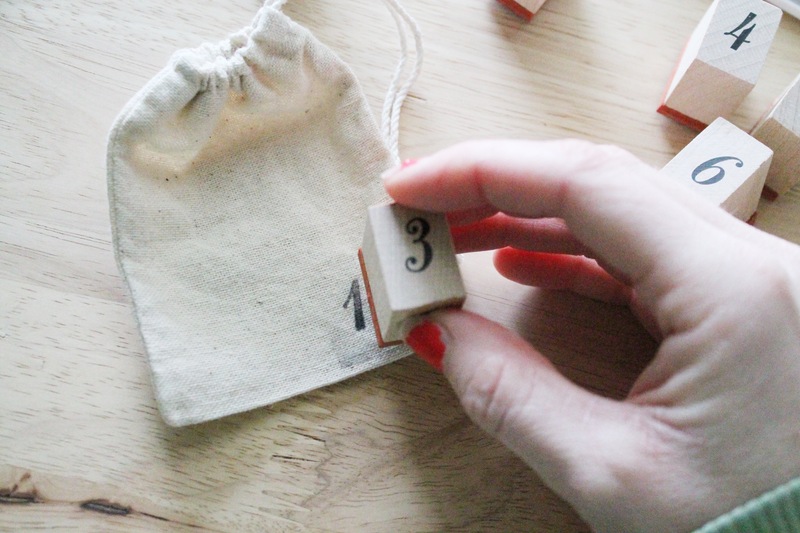 Here is how I made the advent calendar. I started with these little bags I bought at the craft store. I then stamped 1-25 on each of the bags. I found the bags and the stamps at Michaels craft store. I printed the “light the world” calendar onto card stock. Again you can find the calendar here. I then cut along the dotted lines. 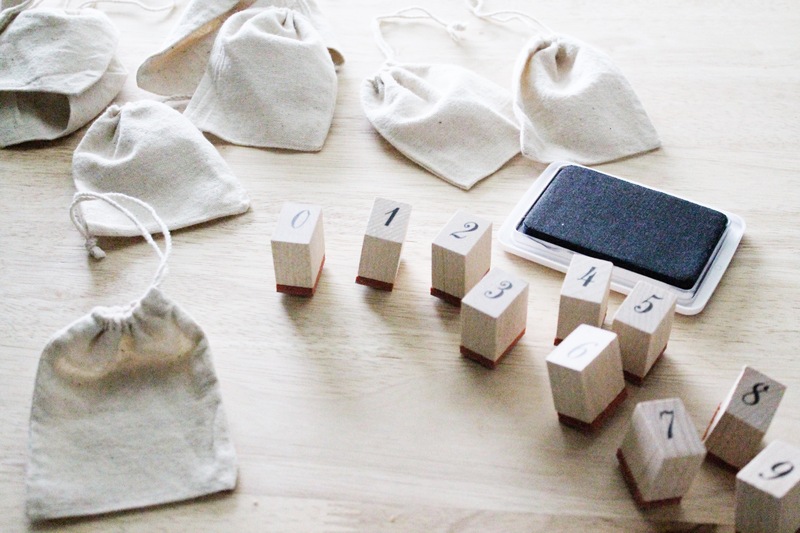 Then I stuffed each bag with the same number on the calendar. This calendar is awesome because it gives you a different way to serve everyday from now until Christmas. It even gives you examples. I love it and I am excited to get started on serving. Next I laid my large frame upside down. The frame was a huge frame that had a mirror in it that fell out. I painted it white to match my gallery wall. 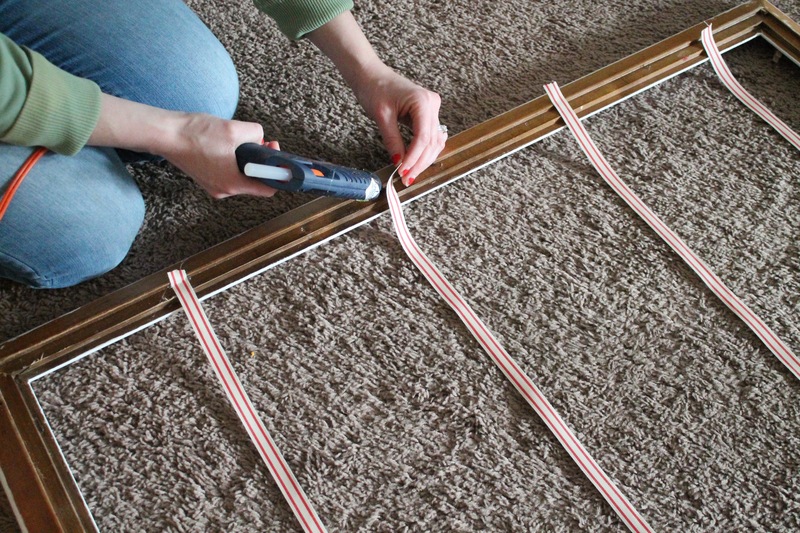 I then cut ribbons to the width of the frame. I cut 4 of the ribbons. I lined them up and spaced them evenly. I glued all of them on one of the sides of the frame with hot glue. Next I slid the bags on making sure they were in order and facing the right direction. 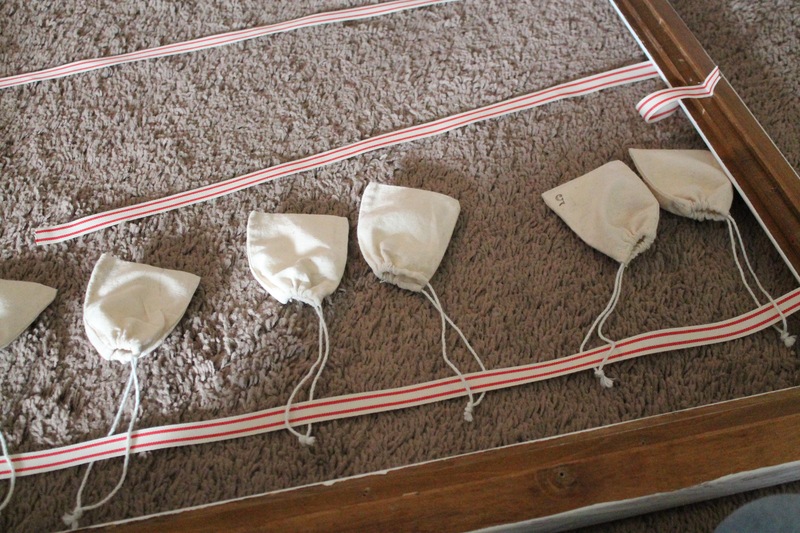 I then glued all the edges to the other end of the frame making sure to pull it tight so the bags don’t sag. I then made a wreath to go in the center. 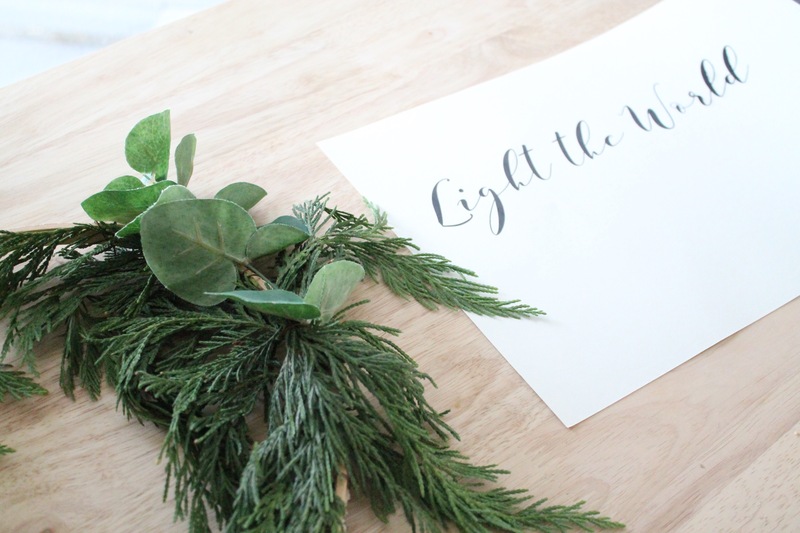 I made a wreath using this tutorial. I printed this “light the world” sign and glued it on the wreath. I decided to print “Light the World” on the wreath because that is the theme of this advent calendar. We are hoping to light with world with service. I also decided to add a matching bow to the wreath. Once I had the wreath done I placed the picture frame on the wall where I wanted it. I then centered the wreath and just pinned it to the wall. I just scooted the other baggies to the sides so the wreath wasn’t blacking any of the bags. I then filled the bags with candy canes and greenery. I might add chocolates to some of the bags later to have a little treat every day. I know Maylee would be happy with the chocolates. I decided to place the large frame on the edge of my gallery wall. That way it flows with the gallery wall during this Christmas season and then I can take it down after Christmas. 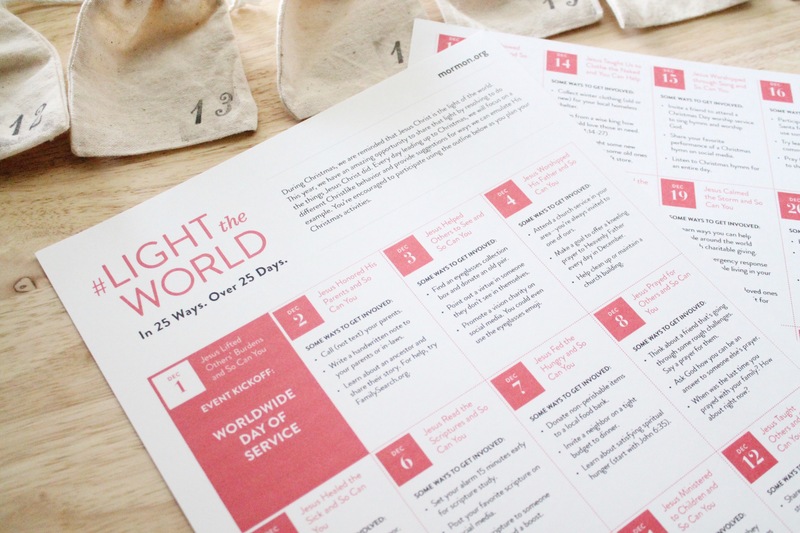 I hope I inspired you to make an advent calendar or use the Light the World advent calendar. I am excited for these next twenty five days leading to Christmas. I hope it is a Merry Christmas season to you!